This article will help you prepare your soil for an organic garden. Organic gardening requires a long-term outlook with respect to soil preparation. In fact, the key to successful organic gardening is to feed the soil with organic matter, which feeds the plant, rather than to feed the plant with inorganic fertilizer as in conventional production. An ideal soil would have equal parts of sand, silt and clay, and contain about 5 percent organic matter. Most mineral soils, such as clay soil, will have less than 2 percent organic matter and are rarely ideal. However, with work, most soils can be improved and made productive. Because it takes a long-term outlook to build a good soil, don't be disappointed if your results are less than ideal the first year or two. New sites should have all plant matter removed or turned under. Areas with Bermuda sods or other invasive plants should have the plants removed to the compost pile and the soil turned under to expose roots and rhizomes to desiccation. In addition, soil solarization (discussed further below) can help control these hard-to-control weeds. Some soils may have hardpans, which are impervious layers several inches under the soil. These hardpans are often found on old farmland or new home sites where equipment has compacted the soil. In either case, these hardpans must be broken up. On clay soils this can be very difficult. Double Digging: For the vegetable garden, soils should be turned to 10 to 12 inches deep. One method is to double dig the garden. Dig a trench 6 to 8 inches deep along one side of the garden, placing the soil on the outside edge of the garden. 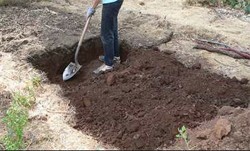 Then use a spade or garden fork to loosen the soil 6 inches deep at the bottom of the trench. Soil adjacent to the trench on the inside edge of the trench is moved to fill the existing trench, creating a new trench in its place. Again with a spade or garden fork, loosen soil in the bottom of this trench to a 6-inch depth. Continue in this fashion until the entire garden has been double dug. The soil from the first trench can then be moved into the last trench. This method of garden preparation will leave a deep turned soil but is very labor intensive. Alternatives include use of equipment such as tractor-mounted plows or a Rototiller set to the deepest depth. Organic matter should be added during this deep-turning process. If you do not make your own compost, most nursery and garden centers or mulch and soil centers have compost available in bags or in bulk.